I know, no posts for a while. What can I say, last quarter was A LOT of work, and this quarter isn’t shaping up to be any different. Maybe eventually I’ll sort through all the files and post the work I did last quarter and learn to be more organized and disciplined about producing work in a timely manner. Not yet, though, and in true procrastinator/borderline ADD manner, I’ve been occupying my time with many things other than studio work recently. I’ve been reading the new Architectural Geometrybook out from Bentley Institute Press. Very math heavy…at least it seems so because I haven’t taken a math class in years. It very thouroughly breaks down and describes the derivations of numerous surface classes seen in contemporary architecture and dabbles into more experimental geometry. Very interesting stuff. Anyway, this comes straight out of one of the section on tiling patterns. 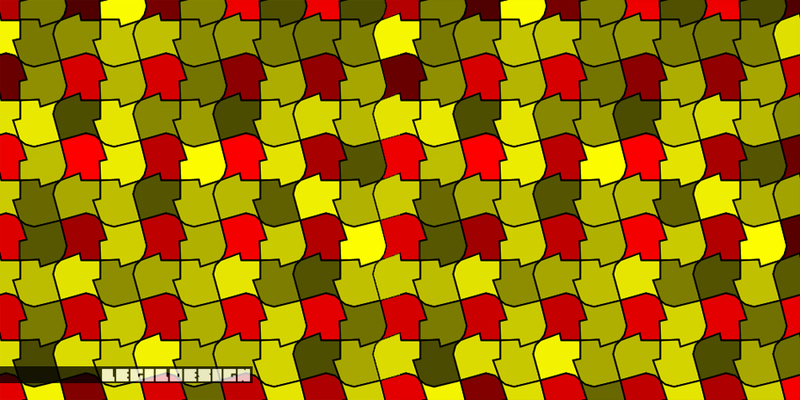 I had never really known (or bothered to care, really) how it is that irregular tessellation such as those of MC Escher come together, but it’s actually really intriguing stuff. This script is base on rectangular tessellation. It deforms a square edge and translates that to its neigbor. The result is an irregular tile that can be tessellated to occupy a space. The original “tile” can be seen in the red(ish) colors, to the right of which is itself rotated 90 degrees clockwise, below it another 90, etc. The script runs a bit slow, but overall it may prove promising. I’m thinking of using this method to develop a facade system or something of the sort.